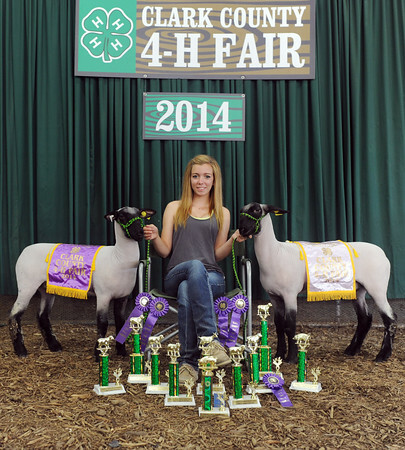 Breann Hendrickson, 19, Charlestown, received 10 trophies, several blue ribbons, a Grand Champion Market Lamb banner, a Reserve Grand Champion banner, a jacket and even a chair while competing in this year's Clark County 4-H. Her livestock, including the two Hampshire market lambs that awarded her the grand and reserve grand champion banners, were born and raised at the Hendrickson's Little Bull Creek Farms in Charlestown. Hendrickson will now be moving on to national competitions with the completion of this year's Clark County 4-H.